Morgan Thorson, Still Life, 2015. Performance detail, Weisman Art Museum, Minneapolis. 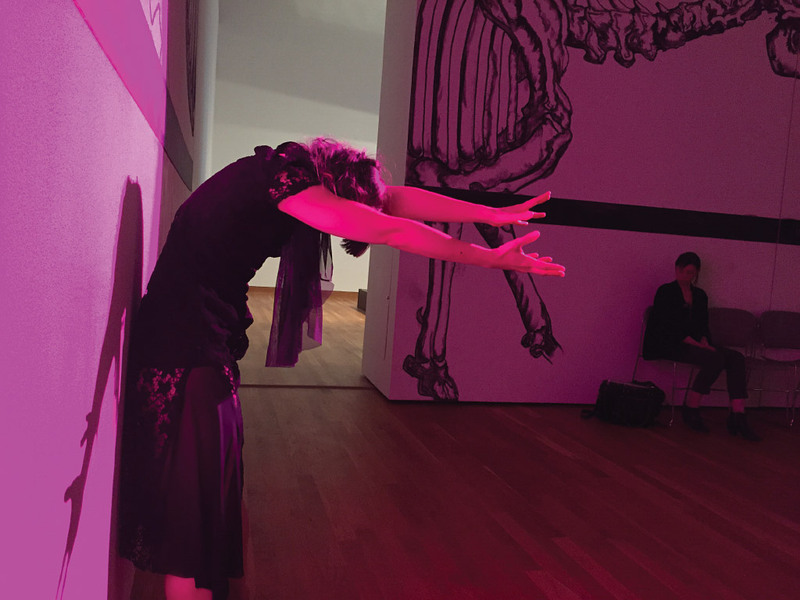 Choreographer Morgan Thorson brings her live installation Still Life to the Portland Art Museum this September in partnership with the Portland Institute for Contemporary Art’s TBA Festival. Still Life is a meditation upon time from the vast span of geological time, represented by large-scale charcoal wall drawings of extinct species, to the immediacy of human life, evoked by a line of chalkboards with hash marks ringing the gallery. Seven dancers perform narratives suggesting erasure, mourning, caretaking, and renewal with movements that alternatively speed up and slow down perceptions of time’s passing. The long-form choreography of Still Life gains extra meaning by being situated in the Museum, where time as history holds special significance. Museum visitors are encouraged to drop in and stay as long as they wish. Still Life is on view in the Jubitz Center for Modern and Contemporary Art. Friday, September 9, 3–8 p.m.
Saturday, September 10, Noon–5 p.m.
Sunday, September 11, Noon–5 p.m.
Tuesday, September 13, Noon–5 p.m.
Wednesday, September 14, Noon–5 p.m.
Curated by Sara Krajewski, The Robert and Mercedes Eichholz Curator of Modern and Contemporary Art, in partnership with the Portland Institute for Contemporary Art. The presentation of Morgan Thorson: Still Life was made possible by the New England Foundation for the Arts’ National Dance Project, with lead funding from the Doris Duke Charitable Foundation and The Andrew W. Mellon Foundation, with additional support from the National Endowment for the Arts.